The second part of Call of Duty: Advanced Warfare’s painfully, perhaps knowingly, stupid Exo Zombies co-op campaign has been condensed into trailer form. If you didn’t already know, it’s some sort of sequel to Being John Malkovich, where all of the Malkovichs have exoskeletons and are also zombies. And they are angry too. 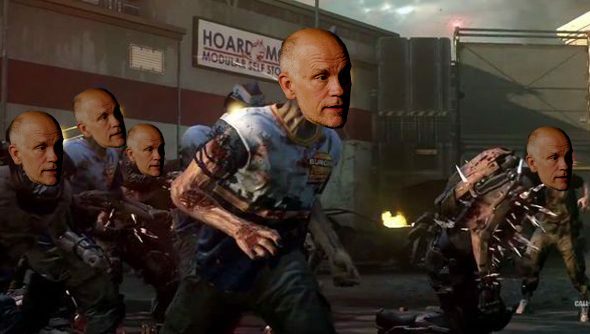 Only John Malkovich can stop the zombie Malkovichs, with a little help from his friends, Rose McGowan, Bill Paxton and John Bernthal. Watch the trailer for Being John Malkovich 2: Exo Zombies Infection below. It’s due out on March 31st on Xbox exclusively, because stacks of money are seductive. It’s a timed exclusive, though, and it will eventually make its way to PC, when you’ll be able to find put a stop to this awful tide of Malkovichs. The zombie campaign is part of the Ascendence DLC, which also includes things Exo grappling powers – everything in the near future is preceded by the world “Exo” – which should go nicely with those jetpacks, four new multiplayer maps and some weapon skins.